SAINT PAUL — Minnesota Governor Tim Walz proposed a package of nearly $1.3 billion in state infrastructure investments February 26. Highlights of the proposed bonding package include $300 million for higher education projects, $345 million for transportation and transit projects, $217 million for agriculture, environment and natural resources projects, and $150 million for housing. The package includes 73 projects across the state. “This is not a wish list. 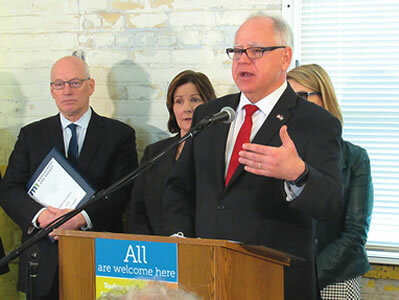 This is what’s needed,” Walz said, speaking at a press event to announce the bonding package at an affordable housing development at Fort Snelling for formerly homeless veterans. “We intentionally made recommendations that were fiscally responsible,” commented Lt. Governor Peggy Flanagan. While the state legislature typically considers a large bonding bill in even-numbered years, “for the last 30 years there have only been two years when we haven’t had a bonding bill,” reported Myron Frans, Minnesota budget commissioner. Senate Majority Leader Paul Gazelka, R-Nisswa, has expressed opposition to passing a large bonding bill this year, which Walz acknowledged at the February 26 news conference. Investing in state infrastructure brings jobs and the Minnesota State Building and Construction Trades Council immediately announced support for the Walz bonding proposal. “By making substantial capital investments in transportation, higher education, housing, corrections and state asset preservation, the Walz-Flanagan Administration is demonstrating its commitment to meeting our state’s construction needs now and, in the future,” said executive director Jessica Looman.